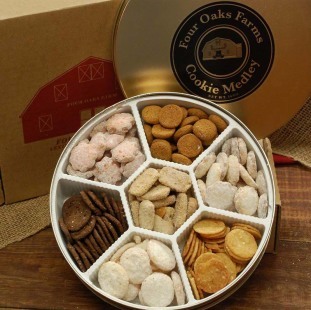 This Cookie Medley is a combination of seven delicious cookies, all neatly packaged in a decorative gift tin. Flavors include: Benne Wafers, Ginger Cookies, Lemon Snaps, Razzberry Sassies, Pete's Pecan Pinches, Colony Coco Crisps, and Carolina Key Lime Cookies. This medley makes a wonderful gift for a small group of people or as a nice addition to your entertainment table. You will love this gift box!